We are starting our initial testing of one of the various CRISBEE products for seasoning Cast Iron. Check back to see updates on how we feel about the product. We received via UPS the (2) Puck Box for testing. 2 – 3.25oz Pucks of the Original formula. 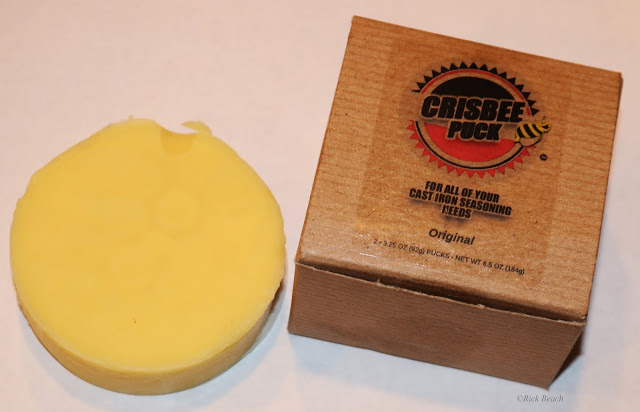 On the Crisbee website it indicates the ingredients are a proprietary blend of Soybean Oil, Palm Oil, and Beeswax. I want to pause here and say over many years, decades actually, I have used a wide variety of oils, lard, shortening etc. Anything someone might say works better. Years ago I stopped messing with oils, and settled on vegetable shortening. I have to say for a long while I like the results I get with plain old white vegetable shortening (Crisco). Of course, stating what you actually use for seasoning, then starts a whole huge debate. I rank cast iron conditioning methods right up there with talking religion or politics. You can’t win no matter what sways your particular notion of things. There are also a whole pot full of ways on doing things. With that said, I keep an open mind and am open to something new that might come along. That puts me at the place I am at today testing the Crisbee product. A product that is new to me, at this time . For testing purposes I will be seasoning a raw cast iron Dutch Oven as one of our tests. This is an 8qt Texsport Deep Dutch Oven that was recently picked up at a garage sale. It is the only thing I have hanging around without at least one layer of season already on it. This Dutch Oven still had its tags attached. It also had its factory layer of wax or paraffin. I have since burned that factory layer off and will be proceeding with baking on a first coat of seasoning using the Crisbee product. I normally collect vintage Cast Iron and have over 150 pieces. This Texsport is not anything special. But when you run across them at a garage sale for $5 or $10 they are hard to pass up. They are rather rough compared to some of my coveted Griswold. So if something rough seasons well, image what some of the nice vintage cast iron might do. My other test piece of cast iron is a rectangular griddle we use over coals or a gas stove. This has been seasoned and well used. The seasoning in the center looks rather porous and worn (too many pancakes flipped from those spots). I am not removing any old seasoning on this piece. A new layer using the Crisbee product will be baked on. The true test is putting this to an egg and pancake “stick” test after a new layer or two. 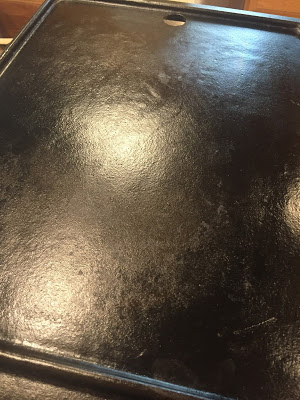 I am looking for this griddle to come out glossy black since the original cast iron surface is extremely smooth. Can we get black colored seasoning by the second coat? The products No “Rancid” claim can not be immediately evaluated by us. I followed the Crisbee’s directions when seasoning the first piece. Used 400°F heat. The finish was a dark caramel brown. Not quite black. Same results I get on a first coat with my own choice of shortening seasoning material. I let the cast iron cool until just warm to the touch. I applied a second layer at this time in preparation of the second coat. I do like the way it adheres in this stage. I was able to rub it in as the iron cooled down. I give the product high marks for this. The piece was completely cooled. On the second test piece (the Griddle) I upped the temperature to 450°F. That is the same temp I use for my standard seasoning choice. I wanted to compare to what I am familiar with. The Crisbee product handled the higher temperature very well. I didn’t experience any smoking to note. The first coat, covering existing seasoning, came out nice and black. The smooth surface of the griddle is about 75% slick at this point. But remember this griddle had prior seasoning on it. I am impressed with the color and the slickness obtained. I also rubbed this down with a very thin coat of Crisbee when it was nearly cooled. Prepping for a second coat. It was cooled completely. Both pieces now have had two coats of Crisbee seasoning applied. Ease of Application: I do like that “waxy” consistency it has when handling. I feel the bee’s wax may fill cast iron pores at a quicker rate. (Some call it pores. a.k.a rough surface). The product liquefies instantly on pre-warmed cast iron. A little goes a long way. As with other methods avoid using paper towels. Paper towels tend to leave little particles that end up in your finished seasoning. I learned this years ago with shortening and even oil products. For superior results use a lint free absorbent cloth. A horse hair/natural bristle brush can be used to work the liquefied product under handles and hard to wipe spots. Smoking: Even at 450°F it did not set off the smoke detectors in the house with any noticeable smoking. Some oil products will cause issues not seen with the Crisbee product. High marks given for this. Can we get black colored seasoning by the second coat? Both the cast iron pieces were a dark black at the end of the second coating. The oven temperature had been upped to 450°F. It could just be the difference in ovens though? I was not using a secondary thermometer in the oven to be more scientific. Just the setting on the oven. The product gets rated high for obtaining dark color quickly, since some methods take longer to progress from the golden dark brown stage to black. Slickness of the finished seasoning Texsport Dutch Oven is a pretty rough cast pot. The Crisbee seasoning did do an excellent job of filling the pores/smoothing roughness. It appears to have a similar appearing seasoned surface, I tend to see when using Crisco. It could be superior as more layers are built up? There is excellent slickness on the griddle. At least eye balling it. The true test to come, is frying some eggs. Also pouring out a couple pancakes onto the surface. Summary of the Seasoning process: From testing the opinion is this product gives very similar results to vegetable shortening (Crisco). Application and the pore/roughness filling ability slightly better than vegetable shortening. The product can handle higher seasoning temperatures than stated in its directions without excessive smoking. The amount of coats to achieve the black finish is pretty much the same as the vegetable shortening method, though Crisbee appears to have a slight advantage in this category too. Cook Surface rating: Follow-up evaluation will be done and added on. The Texsport Dutch Oven has a rough surface from its foundry casting. The Crisbee seasoning has filled the pores/roughness. and the surface looks real good. The test will be baking a sticky Dump Cake in the DO, then seeing how easy or not it cleans up. The griddle came out with a smooth looking slick surface. Eggs and pancakes will give it a real world test. We hope to cook on the griddle this coming week. Check back in a week or so after we have attended our Ghost Town Dutch Oven cooking event and see our final comments. The cost factor verses other products was not a consideration or an objective of this testing. I have never experienced problems with a pot going “rancid” during storage. So I will not be able to rate the products claim that this will not happen using the Crisbee product. If others have experience with Crisbee in this regard, please send us your opinions. The “rancid” issue I have only read about. 1. My opinion and the most important reason I have never experienced the “rancid” issue is I never just “wipe” my cast iron with a product. 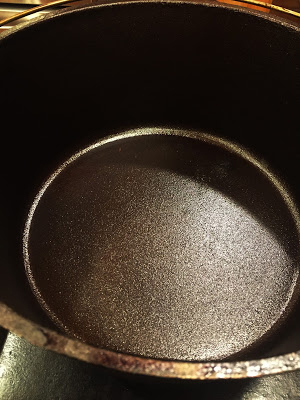 I always use a complete “heat seasoning” cycle before storing my cast iron for any length of time. 3. My cookware gets used continuously year round. Either over charcoal or in my kitchen oven. 4. I learned a tip from a friend some time back. Drape an old but clean cotton sock over the edge of your Dutch Ovens before putting the lid on. In the toe of that sock place one new charcoal briquette. The Charcoal toe end is draped in the pot. The leg end draped over the outside. The lid placed on top of the sock. The charcoal keeps things fresh, and the sock provides an air gap between the pot and lid. This evaluation is all very un-scientific. Only opinions based on lots of experience, and a wide variety products used on my cast iron over several decades. Our week long camping and cooking event is over. I am happy to report the Crisbee seasoned pieces performed very well. Both pieces of Crisbee seasoned cast iron performed as well as any seasoned surface created using my go to product, vegetable shortening (Crisco). I can not report any issue that rates this Crisbee product lower. Cost may be the only factor that differs negatively. But we did not use cost as a determining factor. Food did not stick any more or less. One Dutch Oven recipe was scalloped potatoes and ham that was cooked with charcoal for about 3 hours in the Dutch Oven. Nice browned top with some stuck on baked food especially around the top edge. The pot cleaned up easily with hot water. There was no noticeable effect on the seasoning. 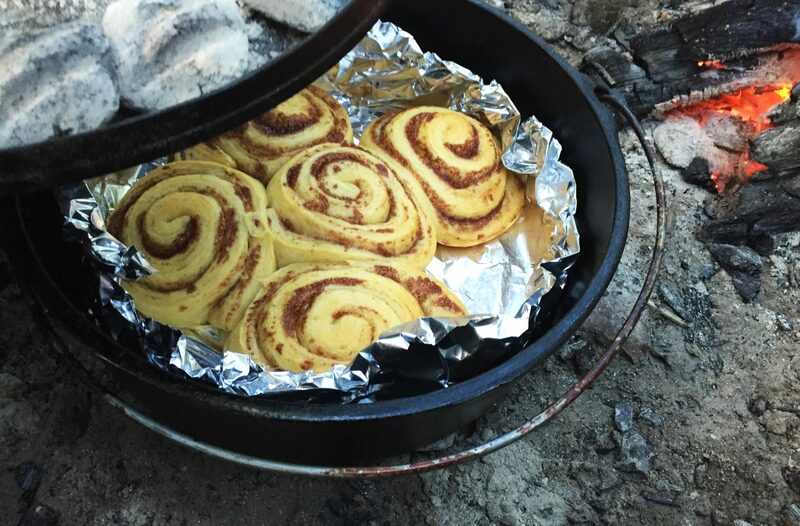 A loaf of bread was also baked in the Dutch Oven and the bottom came out golden brown. The bread lifted right out and did not stick. Eggs and pancakes came off the flat rectangular griddle with the ease of any well seasoned piece of cast iron. In summary. I feel this product has real value as a cast iron seasoning product. People new to seasoning might find it easier to obtain quick results? But be sure to wipe off any excess product with a lint free cloth before baking the seasoning on. You do not want the product to drip or pool during the baking process. This Blog article welcomes your add on opinions and comments should you try the product. Please email us your info, opinions, and photos. Also review our article on Reconditioning & Seasoning. It includes helpful info on a variety of techniques for restoring vintage, or what to do with new that needs its first coat. We promised a follow-up to our original test of October 2015. Here it is. Both our Texsport Dutch Oven and the griddle have had no negative issues concerning the seasoning. Both have several more layers of seasoning, than they did back a year ago. Since our test in 2015 we have only used Crisbee product on these two pieces. Both have only been used over hot charcoal and never open wood fires. The griddle at times has been used with direct contact laying on hot charcoal coals. For the most part the pieces have had thin layers of Crisbee applied immediately after cooking, cleaning, and drying. Both pieces of cast iron maintain a glossy slick black finish. No de-lamination or any evidence of flaking. No rancid smells or “off” taste. We certainly can recommend this product if you are in the market for a seasoning product. As with our one year follow-up we can say “ditto” for sure. We have maintained these two pieces of cast iron with Crisbee only. Even with lots of use they maintain a slick black appearance. No de-lamination or any evidence of flaking. No rancid smells or “off” taste.